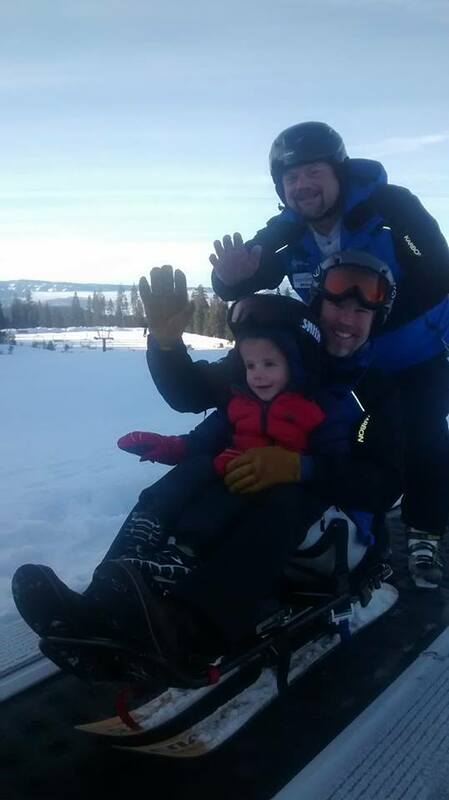 This Tuesday, Jan 30th, 7am at the Pancake House, we have a special presentation from Adaptive Winter Sports of McCall, (AWeSOMe). Over the years AWeSOMe have been giving the joy of winter sports to many special people. However, that's not all AWeSOMe does. Come join us for breakfast and check out their slideshow and see all the great work they have accomplished. Tomorrow, Tuesday, Nov. 14th, we have a guest speaker, Sean McCallister, site administrator at St. Luke’s McCall Hospital. Sean will speak about the hostipal expansion and update us on its developement. Please join us Tuesday, Nov 14th at our 7am Breakfast Meeting at the Pancake House. 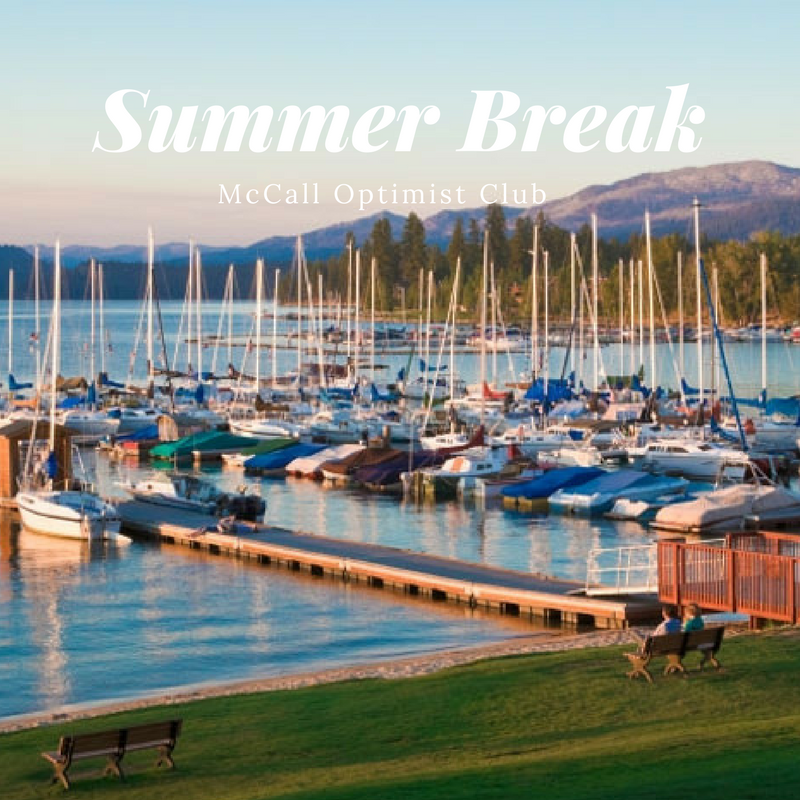 Don't miss the Optimist Club Meeting June 6 - Last one before summer break! 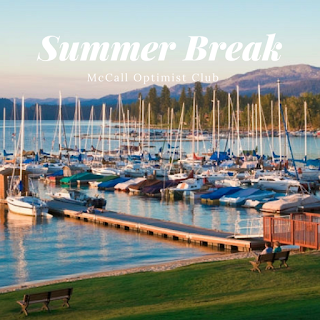 Come join us for breakfast tomorrow morning for our last meeting before the summer break. We have invited our two scholarship recipients and their families as special guest. The Graduation Sober Party was a big success. We will give a review and share photos of the event at the meeting. I hope to see you there. 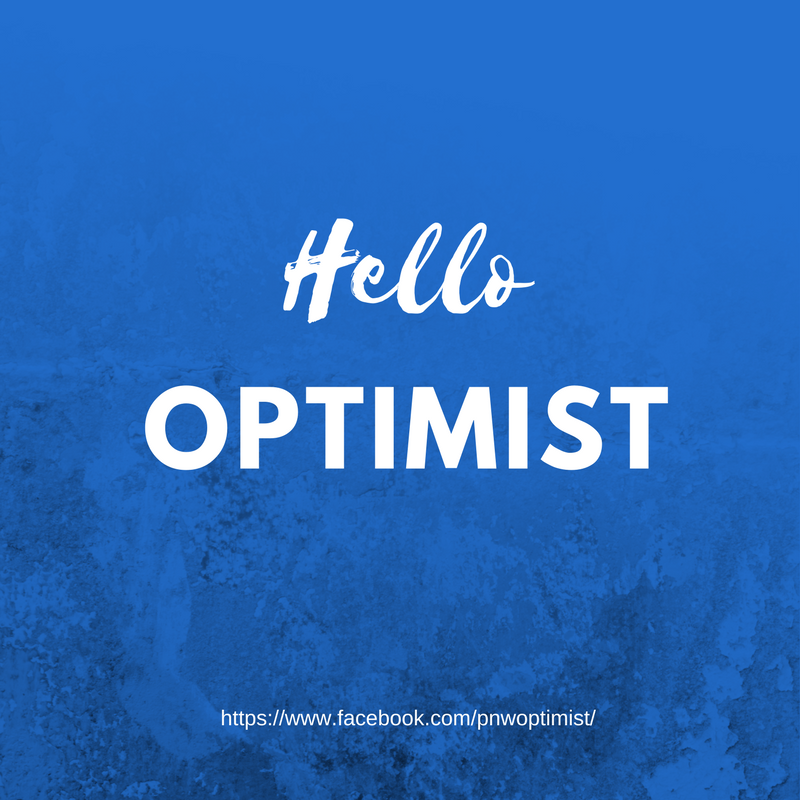 Thank you all for a great Optimist season. Promise yourself: To talk health, happiness and prosperity to every person you meet. 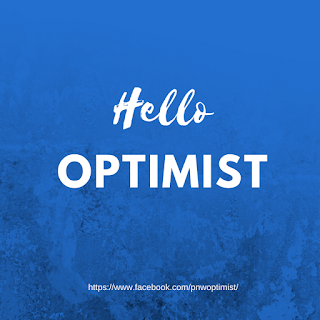 Hello Friends and Optimist. We have a special guest speaker tomorrow morning, May 23rd, at our breakfast meeting 7am at the Pancake House. Kim Pierson is the District Ranger for the New Meadows district. There are a lot of activities on the Payette National Forest. Kim will have a slide presentation that will show many different aspects of work being done on the Payette National Forest. Also, Kim is one of the Forest Leaders heading up Conservation Education for our youth. Don’t’ miss your chance to ask Kim questions about what is happening on the 2.2 million acres of public land around you. · Memorial Day is next Monday. We need at least 4 volunteers that will help raise flags on Friday and take flags down Monday evening. 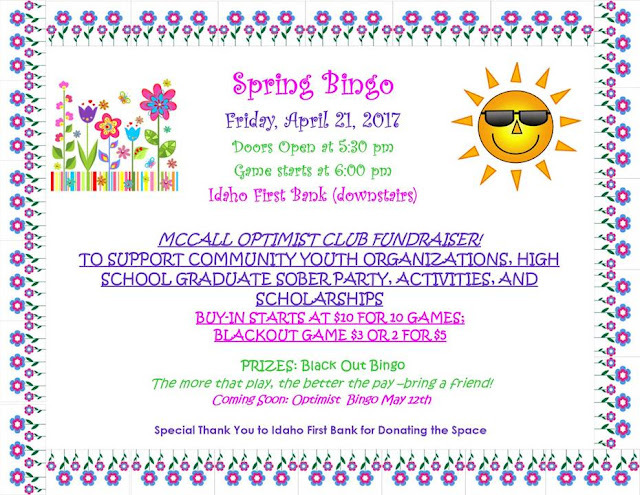 · Senior Sober Party is June 3rd, one week from Saturday. We need volunteers to help with the party and to pick up gifts and donations. 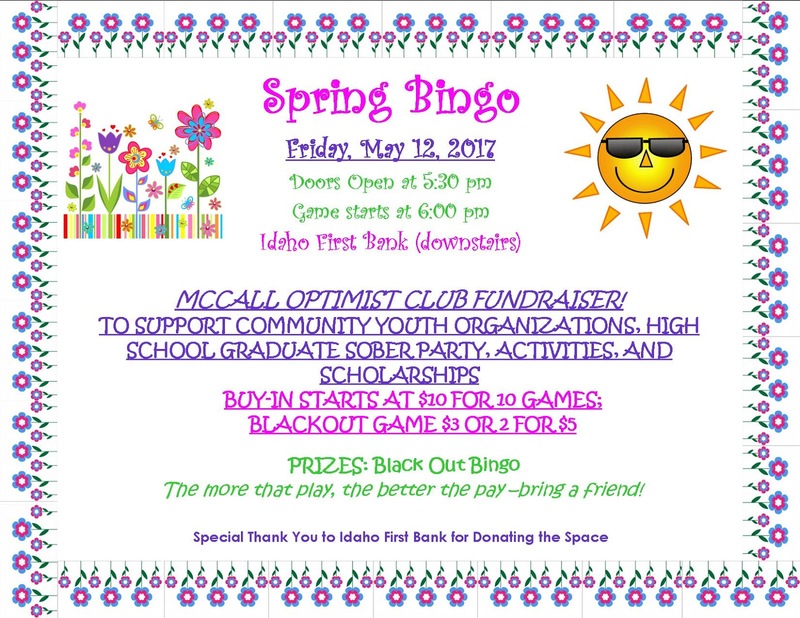 Bingo - April 21, 2017 - Cash Prizes! This coming Tuesday, April 10th, Nate Coyle and Mayor Jackie Aymon will join us at our breakfast meeting. They will present information on the upcoming May 16th Water and Sewer vote. Don’t miss your chance to have a conversation with the City Planner and the Mayor. We have lots to talk about. Please join us and invite a friend. 0700 at the Pancake House. We will have bingo flyers to hand out for the April 21st bingo game and letters to businesses to support our Graduation Sober Party and the Committed Program. Meets weekly, Tuesday, 7:00 a.m.